The Rogers Park Business Alliance has a few different City of Chicago Special Service Areas (SSAs) under its purview, including SSA #43. SSA #43 includes a good portion of Devon Avenue (a busy east/west street in Chicago) and a part of Western Avenue (the city’s longest continuous street). 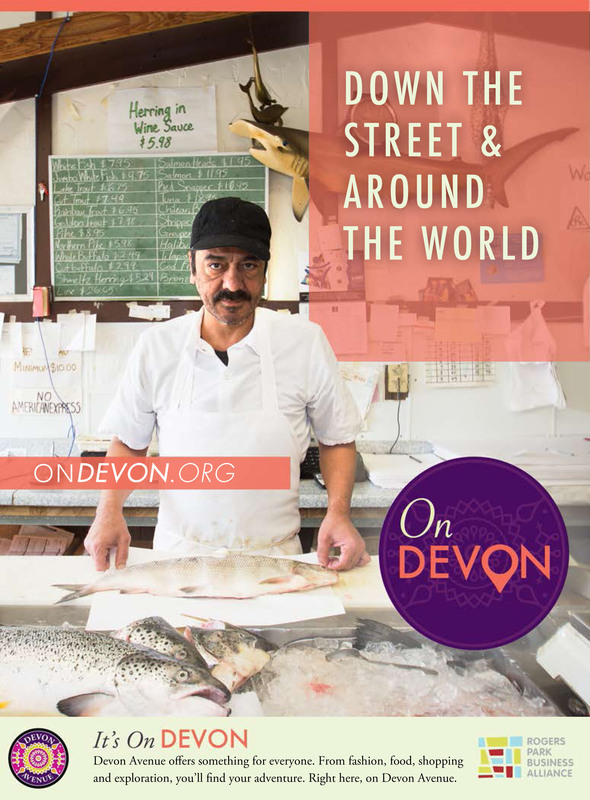 SSA #43 wanted to develop a brand identity for the area and an ad campaign to draw people—city residents and tourists alike—to the businesses to boost the local economy and show off what Devon has to offer. Once Sparkfactor was selected for the project, we started by interviewing business owners and collecting data via a survey to get to know the neighborhood, its residents, and local business owners better. 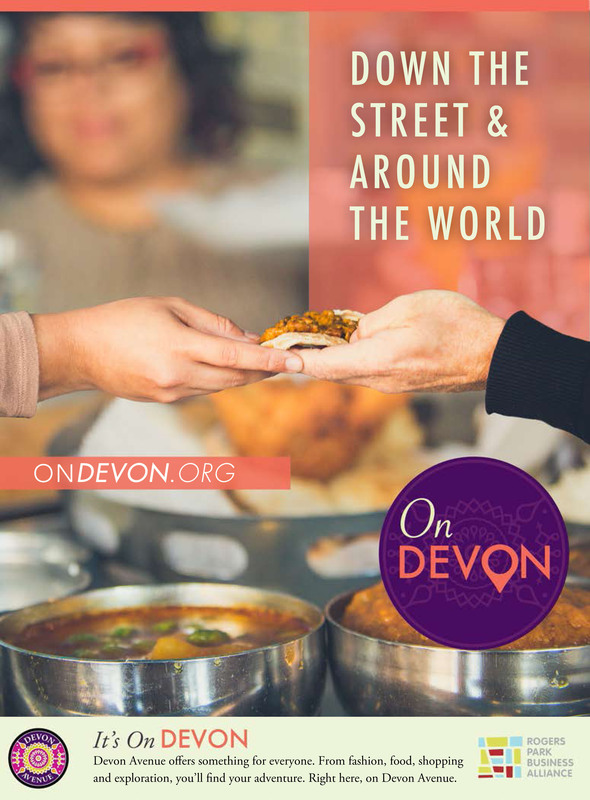 The area is affectionately known throughout the city as Little India, for all the Indian restaurants and clothing stores on Devon. 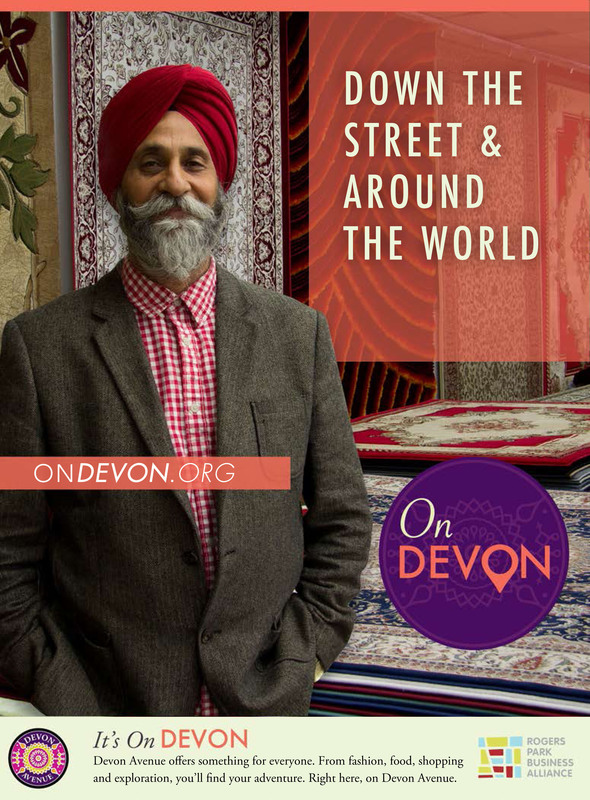 But it is a much more diverse area than that name would suggest: there are people from other parts of South Asia, as well as those who are a part of the Jewish community. We wanted to play on the well-known aspects of the area, while also letting the audience know that there was much more than meets the eye. 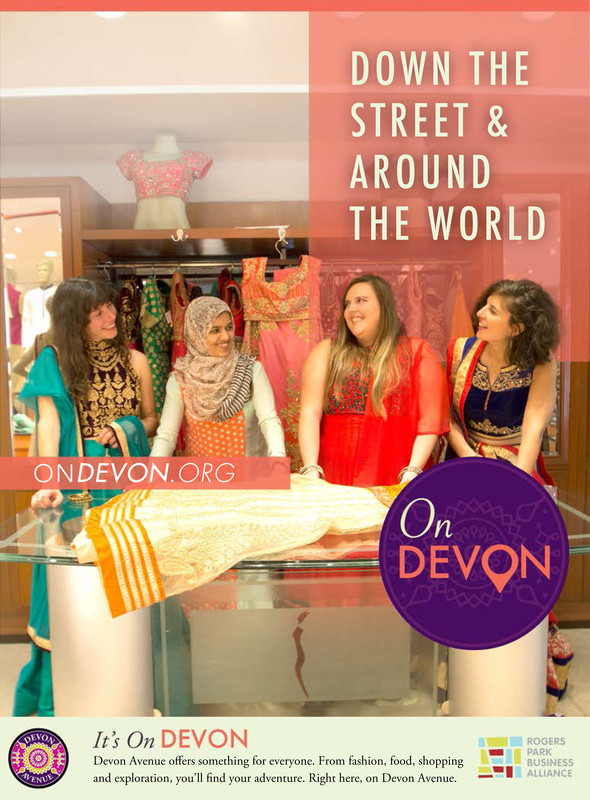 We created an identity around the phrase OnDevon and the tagline, “Down the Street and Around the World.” We really wanted to communicate that Devon is a neighborhood like others in the city and very accessible to any visitors, while also being an exotic place where people from around the world gather and share their culture. So, anything you could want to find, you can find it on Devon. The focus of the ad campaign was to showcase the businesses in the area. 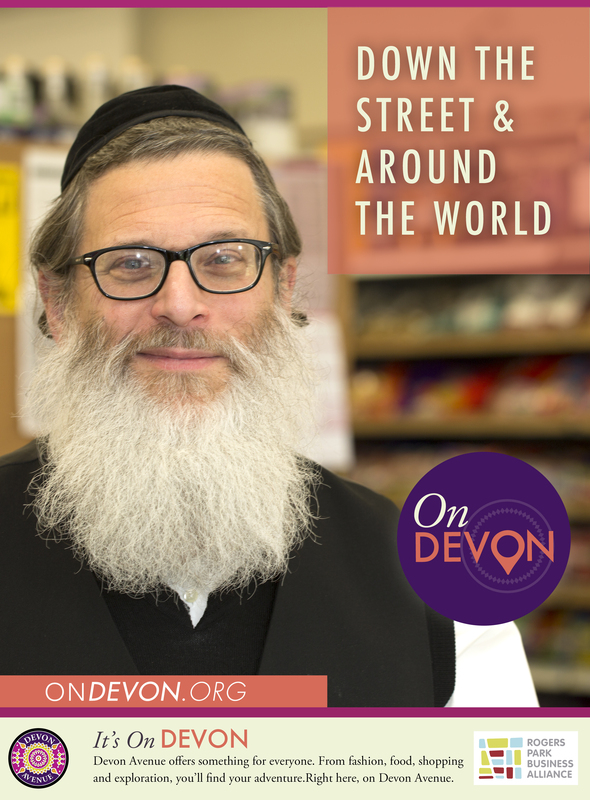 We spent a day photographing business owners, employees, and others in the various shops along Devon and Western to visually communicate the warmth of the neighborhood and the various cultures represented. We created a logo for OnDevon, drawing inspiration from the gateway emblem that Devon already had in place. The ‘o’ in Devon looks like a map marker icon that many are used to from various GPS and map applications. This icon conveys the feeling of finding everything you need right here (on Devon) and can be used in a variety of ways down the line. Once we had the photographs at our disposal, we began to create the ad campaign. We created print ads (see below), social media ads, and street pole banners. We added the logo to each ad to create a cohesive experience for every viewer and we made sure to include the tagline to drive home the point of a welcoming neighborhood with a diverse offering. To help ensure the consistency of current and future ads, we created brand guidelines for the campaign. The guidelines include colors we used for the logo and ads, the correct spacing for various elements in the ads, and a little background on why the guidelines were created and are important. The calls to action on the ads were to learn more about what SSA #43 has to offer by visiting the OnDevon website, which we created using WordPress. 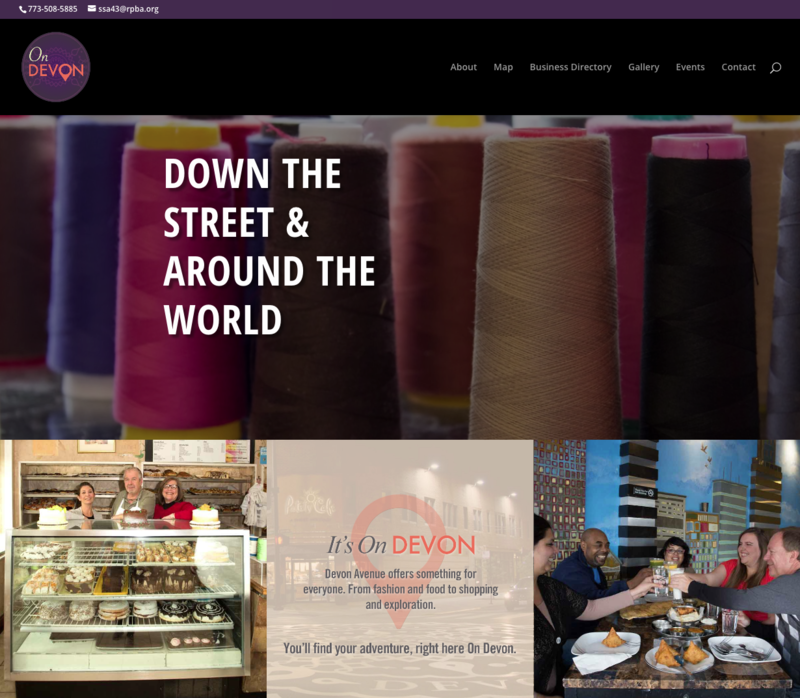 OnDevon.org uses neighborhood website essentials, including images of the neighborhood from our earlier photoshoot, a business directory, a map of the area, and a place for upcoming events to be displayed. Whether you’re looking to advertise local events, create a brand for a neighborhood school or organization, or design a website for important local issues, Sparkfactor can help.